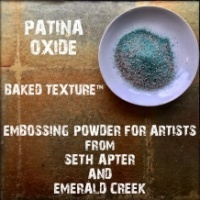 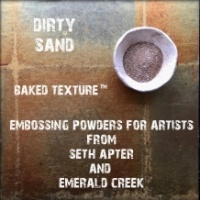 Seth Apter's Baked Texture is a new line of embossing powders for artists from Emerald Creek Craft Supplies. 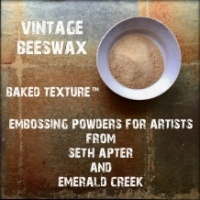 They have collaborated to create a collection of embossing powders that can be used in traditional and in unique ways. 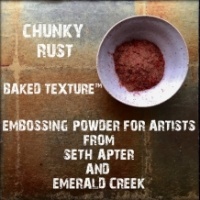 Whether melted or glued on, you will create layers and texture perfect for your mixed media work. 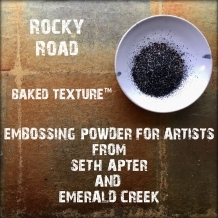 Rocky Road is a highly textured blend of black, gray, taupe and clear powder that creates a rough and textured surface with a sheen. 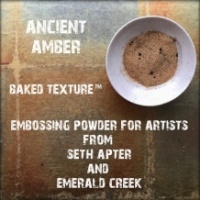 The container is a long-lasting 20 grams.